If you’re in an industry that serves a lot of travelers you know how hard meeting travelers needs is. That’s just in person and you probably don’t know the path they took to find you. Traveling can be stressful and a difficult to use website doesn’t help. If you don’t meet the needs of travelers prior to them visiting you then will they trust you to meet them if they decide to go in? Probably not which is why if your online presence isn’t great then they’re never making it to your business. But how are travelers different than any regular consumer on their journey to spend money with you? It might seem that all consumers are the same and they follow similar paths to purchase. I wish things were so simple for how people actually used the internet to find businesses. Depending on who the consumer is and what industry you’re in the journey can vary dramatically. It’s difficult to capture traveler’s attention. Probably more difficult than any other type of consumer. Meeting travelers needs means there are a few more things you have to contend with than regular consumers. Travelers want to enjoy themselves and have fun with no worries. That means people who are traveling will not put up with any friction in their journey to find your business. Purchasing friction adds stress to travels and the two just don’t mix. There’s also a lack of knowledge in the locale, unlike typical consumers who are very familiar with the local area. they’re not as familiar with the local area. That means you have to account for these things on your website when trying to meet travelers needs. Reducing stress and making it as easy as possible for them to find you is necessary. While accounting for consumers with less patience for barriers in their travels, you have to meet their needs with your website. Speed is the most important thing to meet travelers needs. That doesn’t necessarily mean how fast a website loads either. There are many aspects to website speed and you have to account for them all in a seamless experience for travelers. With one item out of place or something difficult to find (maybe a menu) then you’re going to lose a lot of business. One expectation missed with your online presence and they’ll leave. If that happens on a mass scale then you’re losting a lot of money. a website that works great on mobile devices. your website always loads fast. tasks are easy and quick to accomplish with very little effort. 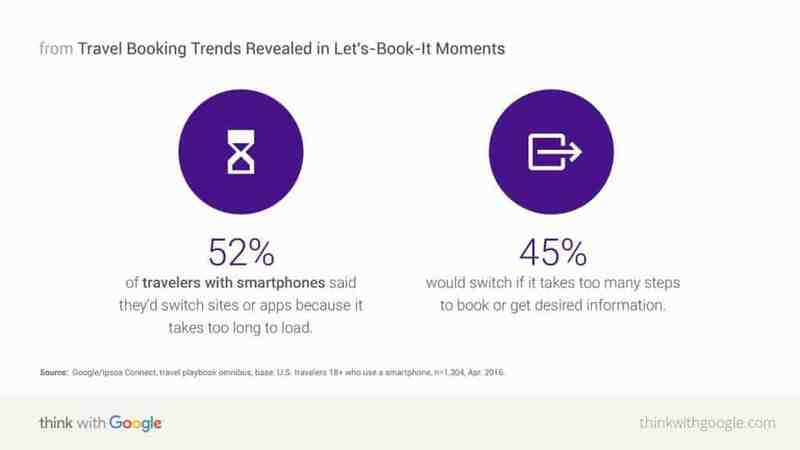 As you can see below, consumers will not stick around to wait for apps or websites that don’t work as needed. You now know that the requirements for meeting travelers needs are high. Aside from giving traveling consumers a better experience on your website, you can also use reviews to improve their views of you. Many people traveling don’t mess with websites that don’t meet expectations so they’ll go with what’s familiar. Many of those searches are dominated by the same players across many markets. These two websites dominate the #1 and sometimes through to #5 spot for major “near me” searches. If you search for “good food near me” on Google the likelihood of one of these two sites being #1 is pretty high. Meeting travelers needs often starts with your profiles on directory websites. That could mean an awesome Google My Business profile or Yelp profile. Or, in most cases, it’s important for a business relying on traveling consumers that all 3 profiles are well maintained. a complete and detailed profile. excellent reviews and lots of them. full contact information and supplemental information such as a website. If you meet all 3 of those requirements on directory websites then there’s a good chance you’re going to thrive. Because no consumer, not even a consumer who’s traveling, will remain on just one website a seamless online presence is important. Consumers don’t look in only one place and their journey could span 5 or more websites before their search ends. A website that meets the needs of travelers adds value to your online presence. Finding a good web designer is one important aspect to building a strong online presence. Meeting travelers needs means a seamless online presence that doesn’t allow consumers to slip through the cracks. Traveling consumers journeys are messy and you want to account for their needs. It could begin on Google, twist through Yelp, then end on your website. Any path they take should lead to the information travelers need with as little resistance as possible. Check out how you can improve your online presence to meet the needs of traveling consumers with an Online Presence Report. With a free consultation, we can get a better idea of where the traveling consumer’s journey is going wrong and how we can increase your business.